It is finally time in the kitchen remodel to build and install the upper kitchen cabinets. These cabinets will be taller than the cabinets that we removed to take up the unused space that was between the cabinets and the ceiling. But before we start making sawdust we need to figure out where we are in the master plan. So I’m sure everyone has been at the edge of their seats keeping up with this project as it’s progressed or at the very least going back to catch up on the road this build is taking. But here is a snap shot of where we are in the Kitchen. The tile flooring, laminate flooring and fridge surround are finished and the lower cabinets have been panted. I have decided to wait on the countertops till all the cabinets are finished. I will be building three upper cabinets. 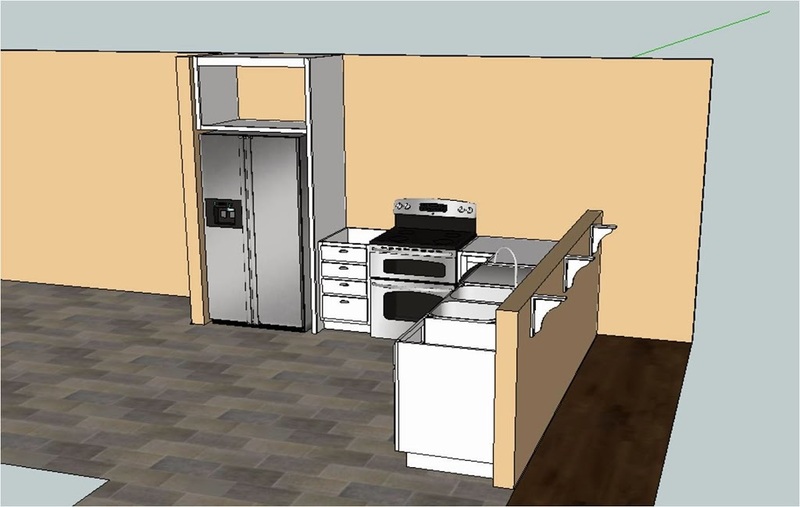 The first one will be a single width cabinet to the left of where the microwave will be above the stove. 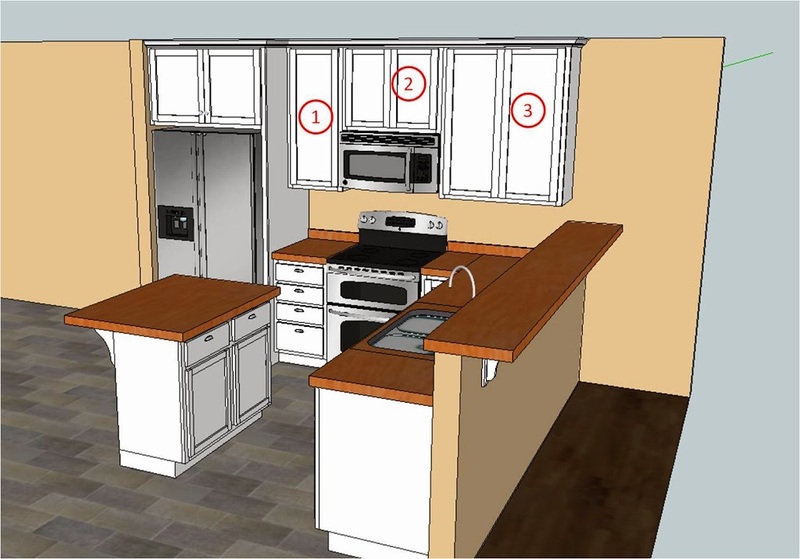 The second cabinet will be a shorter double cabinet that will sit right above the microwave. The third and final cabinet will also be a double width one and be the same height as the first. 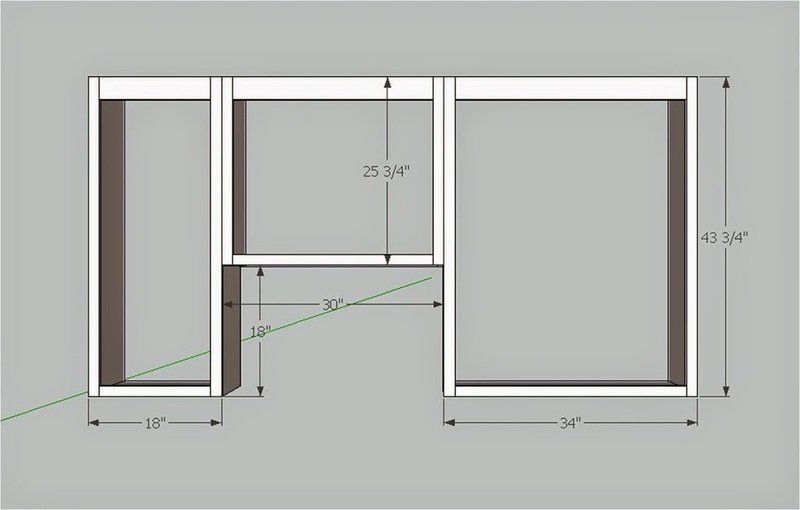 Other than making the cabinets taller than the original one that were in the kitchen there won’t really be any other differences, The carcasses will be made out of 3/4 inch plywood with hardwood face frames. Now since we are painting the cabinets I will be using pine plywood and pine for the face frames. I will be using my Kreg K5 pocket hole jig for both the face frames and cabinet carcasses. Once they are built, painted, and hung we can actually put most of our kitchen stuff away. Our kitchen has been in a disarray for 6 months now and I think both me and my wife (probably more her than me) are ready for things to start getting back to normal. I will make a detailed drawing up of the cabinets and write up a post, take some pictures, and hopefully get some video of the build. In the mean time if you have some time please go over to my YouTube channel and subscribe. I would hate for anyone to miss the excitement. Thanks for taking the time to stop in and check up on me and I look forward till next time.